Apple's financials appear to be heading in the wrong direction. Wall Street analysts expect Apple will report on Tuesday that it had a fairly miserable past quarter. Apple (AAPL) didn't unveil any major products over the last three months. High-end smartphone sales are plateauing, and Apple has no real low-cost solution for prepaid customers and developing global markets. Apple customers are increasingly opting for iPad minis and older iPhone models, which carry lower profit margins than newer and bigger devices. All of those factors will contribute to flat sales and a 22% drop in profit in Apple's fiscal third quarter, analysts predict. That's a nasty development for a company that was regularly posting startup-like profit and sales growth as recently as a year ago. 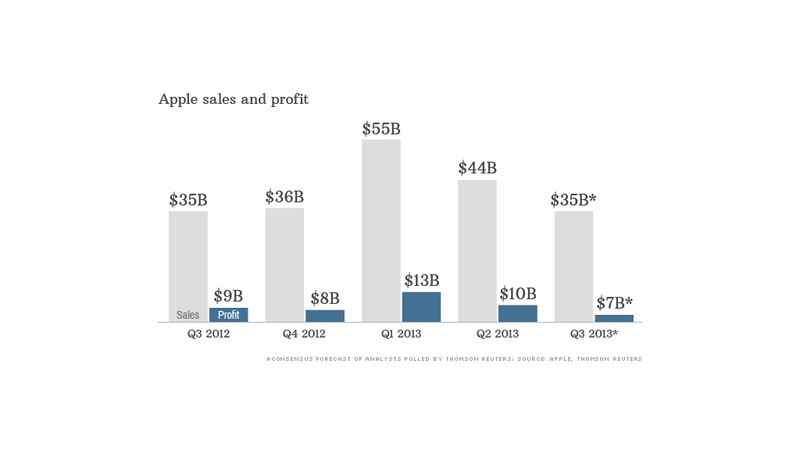 Between October 2009 and March 2012, Apple doubled its quarterly earnings in eight out of 10 quarters. Apple's sales grew by more than 50% in nine of those quarters. There's no question Apple's financials are heading in the wrong direction. Gross margin has fallen in five straight quarters, and Apple announced in April that earnings fell year-over-year for the first time since late 2003. If this past quarter's sales come in below what Apple reported a year ago -- which about half of Wall Street analysts expect to happen -- it will mark the first time that occurred in more than 10 years. All of Apple's recent problems have been stated -- and restated -- time and time again. Apple's precipitous 40% decline in its stock price over the past 10 months has been well documented. Just because it's not growing doesn't mean Apple is unsuccessful. The company is still expected to post $35 billion in sales and $6.9 billion in profit. Apple is currently the sixth largest U.S. company measured by revenue, and its sales are expected to grow by 9% in 2013. Verizon (VZ) last week reported that iPhone sales grew 44% last quarter, and half of the smartphones it sold were made by Apple -- despite the fact that the newer, more feature-rich and better-marketed Samsung Galaxy S4 sits right next to the iPhone 5 on the shelf. Apple's brand still has a lot of cachet, and it remains a big draw for consumers. If the company can develop new, innovative product categories -- perhaps the long-rumored iWatch or iTV would fit the bill -- then Apple has a chance at turning the ship around. Consider what the company's groundbreaking products did for Apple's financials over the past decade. The iPod mini, the first blockbuster product for Apple in years, kicked off seven consecutive quarters of triple-digit profit growth after it debuted in January 2004. Apple's sales tripled between the time the iPod mini first went on sale and the iPhone launched in the summer of 2007. Profit grew 20-fold. The iPhone tripled sales and profit again during its first three years on store shelves, but it was the iPad that launched Apple into the stratosphere. The debut of the iPad in 2010, partnered with the completely redesigned iPhone 4 later that year, helped the company enter that remarkable stretch between the fall of 2009 and the spring of 2012. During that two-and-a-half year period, Apple became the stock market's most valuable company, and Apple posted the second-most profitable quarter in U.S. corporate history. 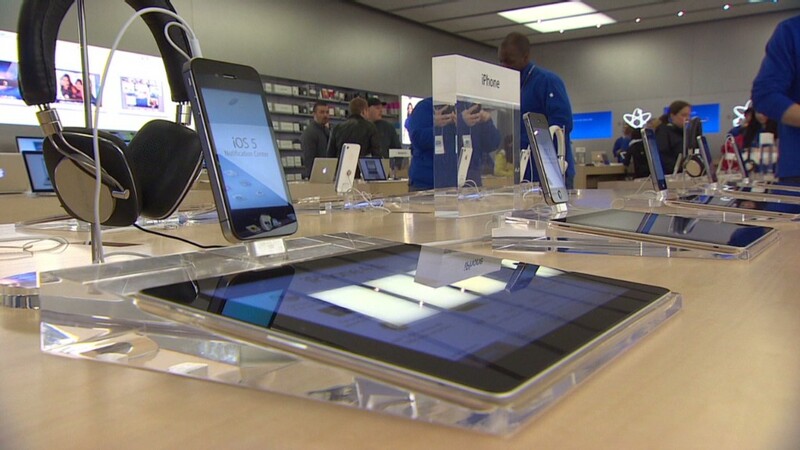 It has been just three years since the iPad, the last major new Apple product, went on sale. If Apple has another revolution or two left in it, the company could return to glory. If not, then the story of this ugly past quarter is going to become a familiar one.